Please keep this manual as it contains important information. arising from defects in material and workmanship. *The warranty period is three (3) months for daycare or commercial purchasers. Caution: Modifications not authorized by the manufacturer may void users authority to operate this device. • Use only size “AA” (LR6) alkaline batteries (4 required). • Charging of rechargeable batteries should only be done under adult supervision. • Remove rechargeable batteries from the product before recharging. • Be sure to insert the batteries correctly and follow the toy and battery manufacturer’s instruction. • Always remove exhausted or dead batteries from the product. • Dispose of dead batteries properly: do not burn or bury them. • Avoid short-circuiting battery terminals. • Remove batteries before placing the unit into storage for a prolonged period of time. proper direction as indicated inside the battery compartment. 3. Replace the compartment cover and tighten the screw. Illustrations are for reference only. Styles may vary from actual contents. Which experiment is right for your child? them to try again and watch as they build a foundation for STEM learning. 1. Choose an experiment card and begin to discover! 2. Unscrew the top lid of the tower. 3. 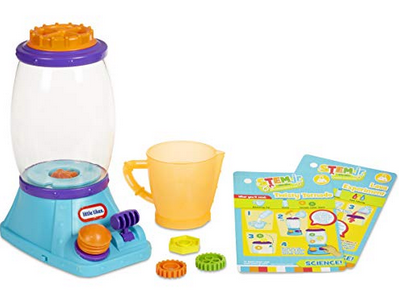 Follow the directions on the experiment card and pour the required ingredients into the tower. 4. When ready, tightly replace the lid. Then, move the switch from the OFF (O) position to the ON (I) position. tornado or push the button to blow bubbles. Note your discoveries for each experiment. • Adult supervision is required. Do not leave children unattended. may cause injury to the person and irreparable damage to the units. • Do not allow long hair or loose apparel, such as hood strings or shoestrings, near the rotor inside the tower. then re-insert them. If there is still a problem, install new batteries. water away from the battery compartment. Do not immerse in water. Allow it to air dry thoroughly before storing. • Switch from the ON position to the OFF position after playing to conserve battery power. • Always supervise when children are playing around water. • Do not leave the tower wet or filled with water near an electrical source or apparatus.